“Boy oh boy,” as my dad used to say. Mike Mooers posted on this site that he was going to respond to that letter and submit this piece. The only regret I have is that I didn’t think of this stuff first; this is an excellent piece. I have very dear friends that work at The Union so I rarely and reluctantly comment on threads about the Union. However, the Union is a cancer to this community with its editorial policy. I implore Mr. Hemig and Mr. Hamilton to listen to this commentary and advance the quality of submissions. I assume Mr. Hemig and Mr. Hamilton are educated men. I assume they understand logic, logical fallacies and journalism. To keep the editorial page, in my words, a cesspool, is mind boggling. Are they really corporately neutered to the point of ineffectiveness? Are they that obstinate? I hope they listen and can turn this around. In the mean time, I can’t watch this animal die. This is at first puzzling. Why was this letter not printed online. Probably an oversight, but they printed it, and that says something. I truly like, and believe in, the folks at The Union. This letter is dead on. How can you be puzzled?!? Running Mr.Saur’s letter is completely consistent with the Union for years/decades. You were featured last month for one of your public service endeavors. Since then, you’ve been a Union apologist. I understand your attempts at bridge building and community camaraderie, yet I feel the Union, your new found precieved acceptance by this media outlet, has made you out to be a sucker, a fool, a chump. Action speaks louder than words. By running Mr. Saur’s letter tells me nothing has changed at the Union and it won’t for any time coming. I was speaking of Mike Moores letter, Chris. 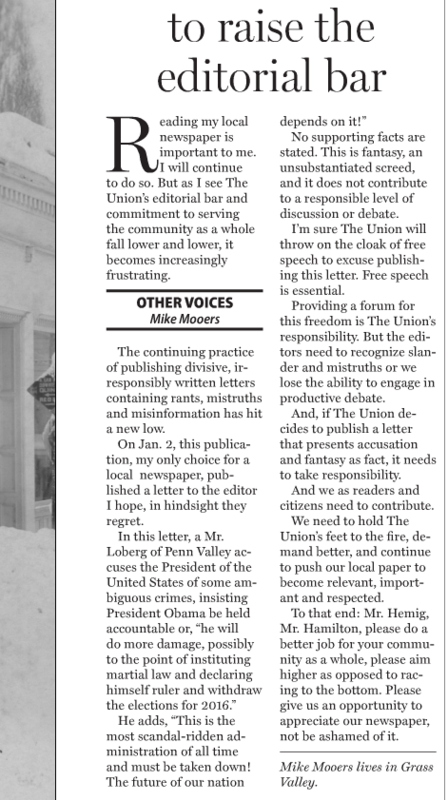 That is a terribly critical letter about The Union editorial policies and it might hurt to print something so critical. I fully agree with it. I am puzzled why this letter wasn’t printed online, though. It was printed quickly and might have been missed. A lot of people think I was belittled for my battle with the city in The Union this week but I think Ivan Natividad did a fair and informative job in his reporting. The community does needs to know what is going on and that includes me if I screw up. Has anyone noticed the disclaimer on the opinion page? Opinions expressed by contributors don’t reflect those of The Union. I cringe every time I read some cogently unreasoned or hysterical composition in the paper. For example, Dr. Wagner’s piece left me wondering if he was ever a good doctor although his long, well regarded tenure in the community will refute that impression. I was left wondering if the dear doctor had developed a medical problem. it’s not up to The Union to judge the expression of those willing to submit. Personally, my only requirement is that publisher ensure that death threat calls to action aren’t allowed like they were 14 – 16 years ago. Free speech requires responsibility but not judgment. The reader is responsible for that. My initial suspicion is that it wasn’t printed online, so it wouldn’t be “searchable.” But when it showed up here and on Facebook (with 12 “likes” and some “attaboy” comments, such as “thank you for posting this” and “great piece”), it probably was better to post it online. As one reader said: “More perniciously, some of the publisher’s columns appear to suggest that discontent with the newspaper starts and ends with Sierra Foothills Report. It doesn’t.” I wonder how long it’s going to take for that to sink in. Happy New Year Jim! I was puzzled too (see above), but apparently this is a rare case of an opinion being published so quickly in hard copy that it beat the line up to be published online. I would love to see some of your opinions published in The Union, Jeff; the door is open. Personally, I don’t by newspapers because the needless use of the paper. If I didn’t think The Union openly and actively opposed my political leanings I would feel more inclined to purchase their online version of the paper. I am all for a free press and freedom of speech but not to the point I will throw down hard earned cash to support a paper that is openly a partisan paper that opposes my positions. I might as well send the Heritage Foundation some money. For years I watch the writing style of the staff of the The Union and have been appalled. How things are worded or implied with a throw away sentence here or there really sticks out to me. Now for those who are wondering if I don’t subscribe how do I read the paper, go to any shop in the area and The Union will be on the counter for anyone to read. I’m glad to see The Union posted Mike’s piece once it was brought to their attention. I really doubt there was any agenda behind the omission, I think it was just an oversight. I read the paper online much more frequently than I read my paper copy, and frankly, it happens. It’s frustrating, but it’s a different issue than the questionable standards of the opinion page. There’s something I’ve run into over the years in the workplace that a former colleague of mine at The Chronicle once jokingly called “anticipatory toadyism.” It is a form of self-censorship at the rank-and-file level to satisfy your boss’ unspoken wishes. It is cultural and systemic in many organizations. It is perfectly plausible that “anticipatory toadyism” was at play in this instance — until somebody from the outside spoke up. I also think this “oversight” and the “questionable standards” of the editorial page are related. It has to do with judgment and competency. You don’t run an “Other Voices” titled “The Union needs to raise the editorial bar” and then “forget” to post it online. Happy New Year! Sorta like CHUCK TODD on video interviewing and NOT ASKING TOUGH QUESTION the guests will not come on. The Union approach.